On April 1 2018, Chiyoda introduced the chief officer system. The board of directors appointed the Chief Compliance Officer (CCO) who is responsible for all issues related to compliance of Chiyoda Corporation and Chiyoda group companies, and has authority to investigate if any non-compliance or potential non-compliance is found, and to issue an order for improvement or termination of such action. The Division Director and the Operations Director is to serve as the Compliance officer (CO) of his or her own divisions and is responsible for implementing measures and policies related to compliance in his or her division under the supervision of the CCO. The president of a group company or his or her proxy is to serve as the Group Company Compliance Officer of his or her company. 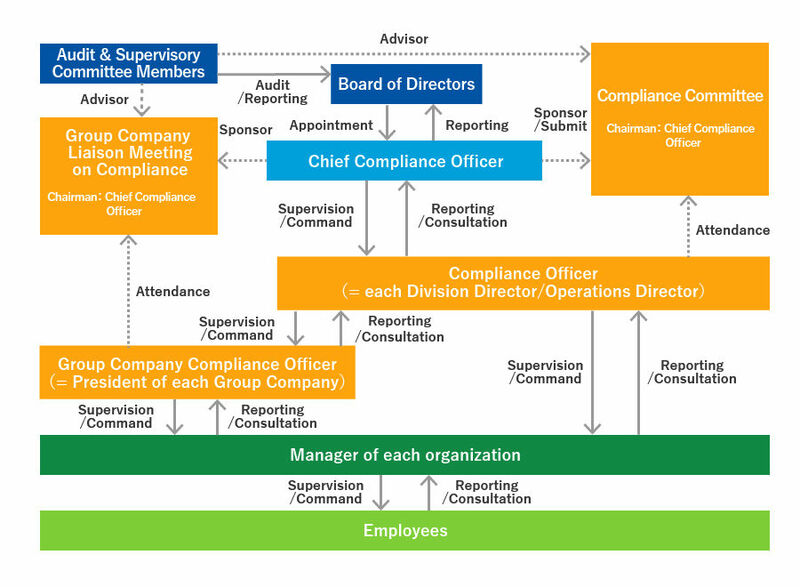 The Group Company Compliance Officer is responsible for implementing measures and policies related to compliance under the supervision of the CO of the governing division. We continuously conduct training on compliance issues including anti-corruption to all employees including our group companies, such as seminars led by outside professionals and online courses by e-learning. With the increase in global compliance risks such as bribery to foreign government officials and human rights issues, we provide pre-assignment training which emphasizes on the risks associated with overseas assignments to employees to be posted overseas. Further, our compliance training extends to joint ventures where we train relevant knowledge on Chiyoda Group's Code of Conduct and compliance rules. Please see our ESG Fact Sheet for compliance training records. Chiyoda Group conducts “Risk Assessment” every fiscal year in order to identify the compliance risk areas (including anti-corruption) which we need to especially focus on. We identify such risk areas by plotting all risk items according to the frequency of occurrence, the degrees of damages and present measures. We implement countermeasures specific to such risk areas. Chiyoda Group implements the following preventive measures and procedures especially for high risk items and pursues them through detailed procedure manuals: "Compliance Due Diligence of business partners prior to entering into any deals, such as vendors and subcontractors in our supply chain, agents, and consultants", "Preliminary checking procedures related to governmental officials", "Preliminary checking procedures related to OFAC", "Preliminary checking procedures for entering into bids", "Preliminary checking procedures for payments of entertainment fees", etc. As part of our mechanism for ensuring compliance of Chiyoda Group Code of Conduct, we conduct periodic monitoring, and if required, implement improvement measures. The monitoring covers areas including Construction Business Act, Act against Delay in Payment of Subcontract Proceeds, etc. to Subcontractors, applicable anti-corruption laws, and anti-trust laws. Further, all divisions in Chiyoda Corporation and Chiyoda group companies conduct self-assessment at the end of every fiscal year to examine their compliance activities. The Legal & Compliance Department which is in charge of promoting compliance, monitors the compliance activities within Chiyoda Group including all activities implemented in each divisions, and reviews the overall compliance program for the next fiscal year. Besides the Legal & Compliance Department, the Internal Audit Department being an independent organization also conducts auditing activities from a different perspective in order to increase effectiveness of Chiyoda's compliance programs. Chiyoda Group established a system to adhere to and manage compliance issues including not only domestic and international laws and regulations, international arrangements, internal policies and rules, but also human rights, harassment, anti-corruption, and information security. The “Rules on Compliance Management System” has been formulated to lay out such framework and to maintain and advance its compliance standards (Please see “Compliance System”). 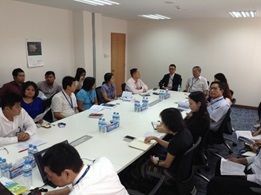 Chiyoda Group regularly holds “Compliance Committee” and “Group Company Liaison Meeting on Compliance” to check and readjust compliance related measures carried out by all divisions and group companies along with its effects and outcomes. At the same time, the utilization of its whistleblowing system is promoted for mutual supervision on any wrongdoing and early detection of compliance violations and potential violations. Particularly for anti-corruption, Chiyoda Group has in place and operates pursuant to a set of detailed procedures for providing economic benefits to public officials and for engaging third parties having a brokering role such as agents and consultants. Chiyoda Group aims to create a more effective compliance system by reviewing its management system from time to time. Chiyoda Group is striving to prevent corrupt practices conducted not only by its member but also by third parties who are engaged by Chiyoda Group and having a brokering role, such as agents and consultants. Application procedures which are finally approved by the CO are set out to check such third party’s eligibility, integrity and ability to perform the service, its cleanliness and the adequacy of consideration, as well as conditions of the contract with them. As of March 2017, Chiyoda Corporation has no record of being exposed or charged for any penalties in relation to anti-corruption.